– Lavender, frankincense, and mandarin essential oils in a rich base of hazelnut and wheat germ oils. Apply on the abdomen, lower back & hips, to help prevent stretch marks. – Help to balance milk production and ease any pain or inflammation with lavender, cypress, and roman chamomile essential oils blended in fractionated coconut and jojoba oils. – Lavender, clary sage, rose and nutmeg, essential oils blended in fractionated coconut and jojoba oils to aid labor and alleviate anxiety. – Ginger, cypress, and lavender essential oils blended in hazelnut, macadamia, and jojoba oils to help alleviate the puffiness that can accompany pregnancy. – Help relieve pregnancy related heartburn with sandalwood, lavender, and rose essential oils blended in fractionated coconut and jojoba oils. 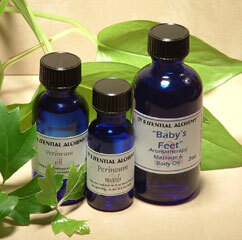 – Lavender and geranium essential oils in almond and jojoba oil. Use in the weeks before birth to help prevent tearing and lessening the chances of needing an episiotomy. – Give or receive a safe and soothing massage with this delicate blend of geranium, mandarin, lavender, and rose essential oils and the flower essence chamomile. Great for use on entire body. – Rosemary and lavender oils in hazelnut, rose hip seed, and vitamin e oils help heal stretch marks. For use after pregnancy. – Lavender, cypress, and roman chamomile essential oils blended in fractionated coconut and jojoba oils with the flower essence crab apple to promote healing. Use in a sitz bath or dilute in a squirt bottle and use as a wash. 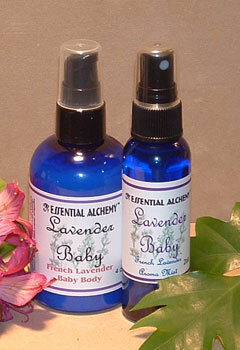 The gentle floral aroma of French Lavender essential oil is used in our new Lavender Baby line. The balancing effects will help to soothe and relax your baby. The lotion is made with natural ingredients. No alcohol or petroleum. The aroma mist can be used lightly on linens or to freshen baby's environment. Click here for other lotions.